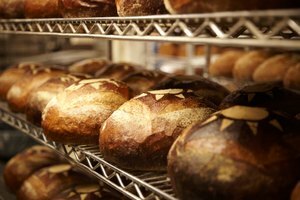 Few kitchen aromas are as comforting as the smell of bread baking. Learning to bake your own at home is a fundamental kitchen skill -- one that almost anybody can achieve. Still, as simple as bread is, there are a number of ways it can go wrong. For example, your loaf might get dry and crumbly with a coarse texture rather than a soft, fine crumb. There are several ways that this can happen, but mostly they boil down to just a few causes. One of those basic problems is a lack of proper gluten development. This often-demonized substance is simply the naturally occurring protein in wheat. When you moisten your flour and mix it, those proteins form long, elastic strands. Those strands trap gas produced by the bread's yeast as the dough rises and steam generates while the bread bakes. This gives your bread its height and texture. If you didn't create enough gluten in your dough, it will be crumbly and coarse rather than light and airy. If you skimped on kneading your bread, it can lead to a crumbly loaf. It's seldom an issue if you make your dough in a bread machine or a big stand mixer, but it's common with hand-kneaded loaves. It takes about 10 minutes' kneading to make a good loaf, a surprisingly long time when you're doing it by hand. There is an alternative. French food scientist Raymond Calvel discovered through experimentation that resting the dough for 20 minutes or so allowed gluten to begin forming on its own. After resting, the dough requires only about half the kneading time. It's a good technique, one that improves most loaves. Another alternative is simply to give the bread a second rise before placing it in the pans. By punching down the dough and kneading it after the first rise, you develop more gluten and elasticity. Even the best bread-making technique won't help if your flour is low in gluten-forming proteins. All-purpose flour in the South tends not to be as "strong" as in the North, for example, and whole-wheat flour creates less gluten than white. 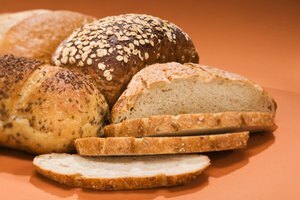 Most other grains contain little or no gluten, so multi-grain loaves can be especially problematic. You can tilt the odds back in your favor by using bread flour, which has more gluten than all-purpose. You can also purchase gluten flour, or vital wheat gluten, at health stores. This is a concentrated form of gluten, and even a spoonful added to your batch will improve its rise and texture dramatically. A well-kneaded loaf made with gluten-rich flour can still fail, often because of misfortune as the bread rises or "ferments." The yeasts that make your bread rise consume sugars and in exchange create carbon dioxide -- which provides the lift -- and small quantities of alcohol. If you allow the yeasts to thrive too freely, they begin to generate more alcohol. This weakens the gluten and creates unwelcome flavors and aromas. If your bread is low, crumbly and smells sour, this is probably where you've gone wrong. Using too much yeast is a common cause. Those little envelopes of yeast from the supermarket hold 2 1/2 teaspoons of yeast granules, enough for a batch of bread using 3 to 4 cups of flour. Unless you're making a sweet bread, the recipe shouldn't call for more. Cutting back on salt is another frequent reason for over-fermentation. Salt inhibits the growth of yeast, and recipes call for an amount that will allow the yeast to reproduce slowly but steadily. Even for the sodium-averse, the quantity in your bread should seldom be an issue, so use the full amount. Often, that one correction will make your problem go away. For home bakers, bread rises best at temperatures in the 70s and low 80s Fahrenheit. If it's hotter than that, the yeasts will reproduce too enthusiastically and produce excessive alcohol. On really hot days, look for a cool place rather than a warm one for your bread to rise. Letting your bread rise too long will have a similar effect. 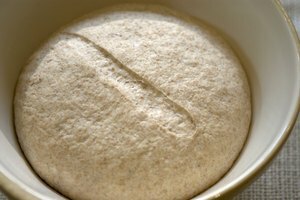 Your dough won't always rise to double its initial bulk -- or you can be mistaken, thanks to the shape of your bowl -- so when in doubt, rely on the finger test. Prod the dough gently with a finger, and if the finger hole retains its shape, or if the dough deflates, it's definitely ready. Any hint of a sour smell is another urgent cue that it's time to punch down your dough. Deflating and kneading the dough at this point redistributes the yeasts and their food, and prevents over-fermentation. Even if you've done everything right up to this point, you might find that your bread doesn't come out right. That's often because your oven's temperature is inaccurate. Breads are typically baked at 350 F, and it's not uncommon for home ovens to be off by 20 to 30 degrees or even more. If you find that baked goods in general take longer than they should in your oven -- or it "runs slow," as some bakers put it -- that could be your issue. Purchase one or two inexpensive oven thermometers, and use them to verify your oven's real temperature. Then nudge up the dial until you reach a true 350 F. This often will clear up the problem -- and improve your other baked goods as well.